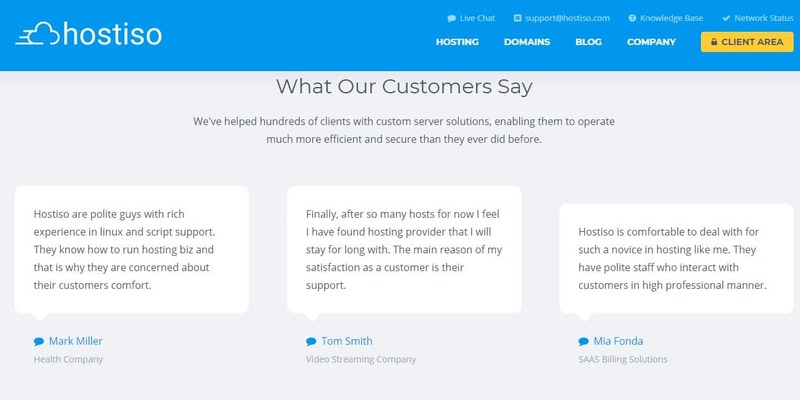 Hostiso Review 2019: Is Hostiso a Good Hosting? With a low latency global network, Hostiso lets you deploy optimized servers close to your customer base. You can choose servers in Buffalo, London, Sydney, Frankfurt, Roubaix, and Montreal. onClick="trackClickout('event', 'clickout', 'Vendor Page - Visit User Reviews', 'Hostiso', this, true);"
Their free migration service is a real bonus, freeing up my time to do other things whilst they migrate my current websites across to their servers. Hostiso are so good at what they do I felt compelled to write this testimonial, which doesn't happen often. Well done to the entire Hostiso.com team. Keep doing what you're doing and I will remain a customer for life. I've had my site and several sub-domains hosted on Hostiso web hosting account for over 1 month, and have had nothing but positive experience. Their support responds quickly to my support tickets, and keeps introducing cool new services and add-ons. I cant say about prices since I haven't looked at any other hosts, but worth every penny. First time purchasing a domain and hosting, but have found Hostiso easy to navigate, easy to use, and whenever I haven't been able to figure anything out, the customer support has been top notch! The Hostiso customer support is fast, responsive, and friendly, each time I've contacted them they've been able to quickly solve my issue or easily explain what I needed to do, in language I was able to understand, which is crucially important for a new like me. Great hosting company, support and speed are really nice. We hosting with hostiso several year now, and we can only praise them, if there was any problems they are resolved swiftly. They use latest software and hardware to provide top performance, speed, security. Hostiso.com offers a range of hosting solutions, such as shared hosting and dedicated servers backed with unmatched support and security. Since 2010, they hosted thousands of clients around the world! Are you constant that your servers could come under constant attack? Hostiso provides advanced server security in addition to DDoS protection not just for your IP address but all your products at no extra cost. In the event of a XOR DDoS or Spoofed SYN, the company will reroute your network so that your servers are not overwhelmed. Their dedicated hosting comes with 500 Gbit mitigation capacity. What’s more? Your servers are housed in a fireproof and flood-proof Tier-4 facility with 24-hour protection. Hostiso offers hosting plans that are suitable for mission-critical enterprises. Their introductory package, Basic Plan, comes with unlimited domains, 100GB RAID storage and unmetered bandwidth. It’s suitable for personal websites with medium traffic. Business Plan – the most popular package – comes with unmetered bandwidth, unlimited hosted domains, and 500GB RAID storage. This plan is ideal for enterprise sites with huge traffic. If you require unlimited storage and hosted domains in addition to unmetered bandwidth and remote hands, you may want to consider the Pro Plan. It’s suitable for enterprise content management. Besides shared hosting, Hostiso also offers custom hosting solutions to enterprise clients who require high performance servers that are secure and fully redundant. All three hosting plans include a free SSL and app installer. You can pay monthly or annually. If you so wish, you can extend your web resources by getting add-ons such as Spamtrawler Protection, a dedicated IP address, Cloudflare Pro, and premium SSL for a few dollars. Hostiso does a fantastic job of providing 24/7 support to their customers. They have witty and friendly in-house support team who can assist you to set up servers properly, update your software, and monitor their performance as well. You can reach out to them via live chat or their ticketing support portal. Ticket response takes 15 minutes to 1 hour. If you need help troubleshooting a server or resolving a case, you can count on them to get the job done fast. Hostiso delivers dedicated hosting to businesses and shared hosting solutions with top-level security in addition to exceptional linux support. Wondering how Hostiso stacks up against other Web Hosting companies? Enter any other Web Hosting company and we will give you a side-by-side comparison.